When the Batik has gone through all the waxing, dyeing and rinsing stages desired it is time to remove the wax. 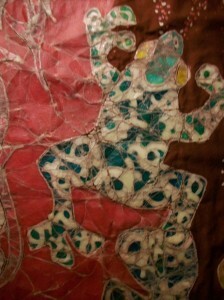 See my photos of batik before the wax is removed. You can see quite a build up of wax.There are several ways to remove wax. First, many scrape the loose wax from the fabric before anything else is done. (This is not necessary). The wax can be then be reused if heated and strained through cheesecloth. Wax can be removed by immersing in boiling water, when cool, the wax on the top can be picked off and the fabric dried and ironed free of wrinkles. (I feel this method to be risky to use on a detailed batik image.) I iron the wax out of the fabric. As with all heating of wax processes, the fumes should not be inhaled. So iron out only in a well ventilated area. Industrial masks with filters are available as well to protect against fumes. Dry cleaning solvents are available, but should be used after most the wax is ironed out. When I iron the wax out, I first prepare a flat table with several layers of old printed newsprint, then a layer of plain newsprint or paper towels. Do not let the batik touch printed newsprint or the headlines may become a prominent part of the image. Place the batik on top of these layers and then cover first with plain newsprint or paper towels, then several layers of printed newsprint. The printed paper helps to keep the costs down and all plain newsprint can be used if desired. 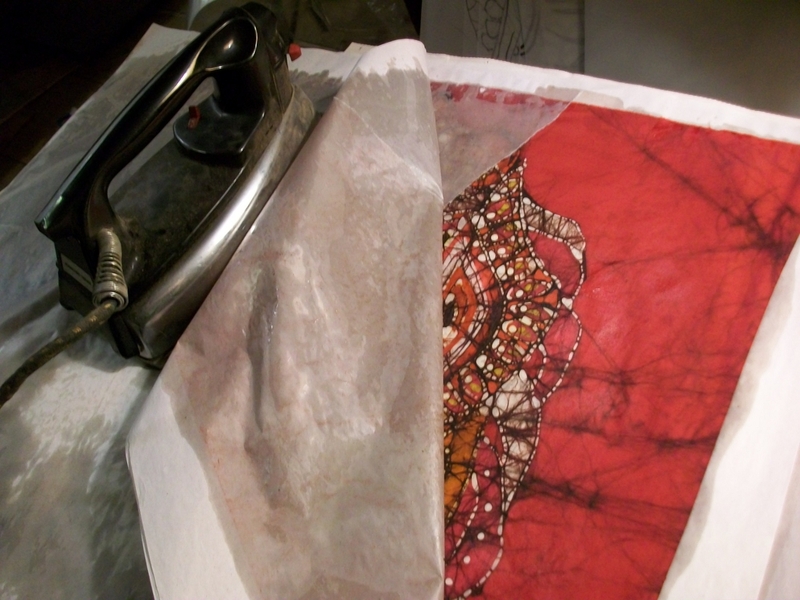 The iron now moves over the whole image until the paper is saturated with wax. Then all the waxed paper is removed and new is placed under and over the batik. The process is repeated until no more wax is absorbed into the paper. The time it takes varies depending on how much wax is in the image and the size of the batik. Always keep in mind the flammable nature of wax. Dispose of the waxed paper carefully. Batik paintings that have the wax removed always come with surprises from the interaction of wax and dye. It is fascinating to me. With ironing, the batik always have a wax residue that gives a slightly stiff parchment like feeling to the cloth. After ironing, dry cleaning may be used to remove the rest. Solvents are available, but I do not want to have to work with or dispose of them. A finished batik can be ironed and should not be displayed in sunlight as in time all things will fade. Museum glass gives good protection here, but is very expensive. The batik can now be mounted on a wooden hanger, another large piece of fabric, be dry mounted and framed or stretched on canvas stretches over a cotton backing. Enjoy the brilliant colors and unique veining in the wax where ever you decide to hang your batik. I have a piece of batik that was folded and now has a crease in it. Any suggestions for getting the crease out? I do not know what stage this batik is in. If the wax has been ironed out and there is a residue of wax and the fold shows, just iron it again. If the batik is in an unfinished stage with the wax on it that fold line will stay until the wax is removed. If you can incorporate the fold line into the design great, but if not the wax must all be removed before more can be done. Dry cleaning fluids will do this but I do not use them as I do not know how to deal with disposing those chemicals. Another method some use is to boil out the wax. Caution must always be used when boiling water and wax as the wax can be bubbled out of the pot and start a fire. Another thing to try if wax is still on it is to crumple the whole batik which will create more crackle and hide the fold line. None of these suggestions are easy and I hope this helps. Linda is back, well I found out that if you ever run out of wax there is always school glue. I found out that I had so much fun with school glue and trying to make batiking out of this and now I guess I will try to use wax next.. so if you ever run out of wax and can not get to the store you can always use this, and it works well with any dyes too. Thank you for the tip Linda. School glue is ideal for kids doing batik. Hot wax can burn. Have to admit I love the wax and use a beeswax / Paraffin mix. I have a lot right now and a friend with bees. Best of luck with your batik and blog! I have a batik that the colors are faded, even though it has never been displayed in full sun. Could it be that the wax has clouded? Is there any way to revitalize the colors? Nor has it ever been washed. Not really. Unfortunately Batik in a bright room without direct sun can still fade. I do not know the specifics of the setting process on the dyes. There are different processes and quality to the dyes. Sometimes ironing the fabric will brighten it a bit if there is a residue of wax in the cloth. Thank you for the quick reply, Carol!